In this second volume we now find the robot children Alex and Freddy as fully made members of R.A.I.D., a special government unit that helps protect the country against robots with ill intent. And they’re loving it. But the country doesn’t suffer from troublesome robot problems all the time, so for Alex and Freddy it’s still about the day-to-day tasks of school, homework and keeping your room tidy, not to mention fitting in some full-on battle training. Naturally, their outings to bash bad robots gets them the attention of the public, and soon Freddy finds himself fantastically famous – possibly not the sort of intense focus a young impressionable mind needs. Slowly they learn that the robotic threat they face is hidden beneath their feet in old London Underground tunnels, but the nature of it isn’t quite what anyone expected, and it just might harbour the biggest threat of all. 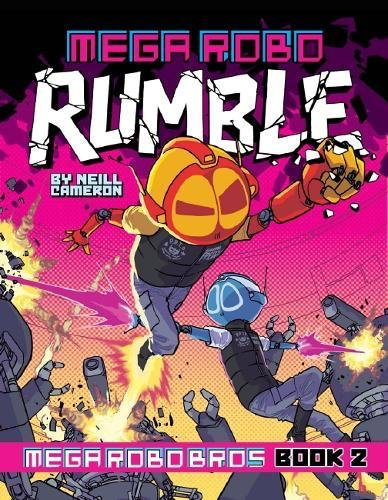 Neill Cameron’s creation of a near-future multi-cultural London plagued by dodgy droids and angry androids could be a vision of a bleak and disturbing place, but the presence of Alex and Freddy grounds it in the everyday, despite them being extremely powerful constructs themselves. Their childhood innocence and insecurities cleverly reflect our own experiences of growing up, except in Alex and Freddy’s case it also involves discovering that you can fly, shoot lasers and adjust your temperature; all tantamount to being a superhero. In other hands this could be a dark dystopian tale, but Cameron is able to lift it to being a celebration of childhood and imagination. This is an ideal book for kids, full of fun, drama and action, which adults can enjoy too.